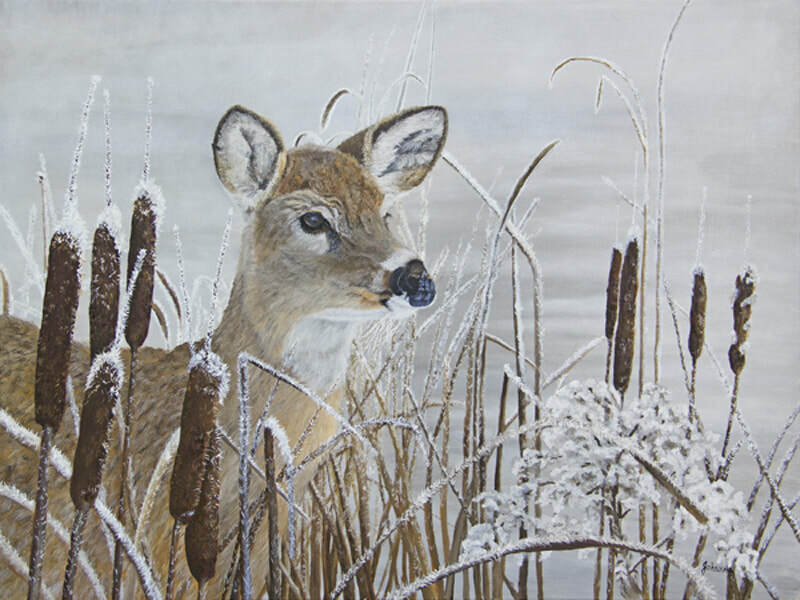 The painting depicts a whitetail doe among the reeds and cattails, blanketed with hoar frost as the fog lifts off a partially frozen pond. Something has caught her attention as she stares intently, possibly a whitetail buck in Winters Magical Moment. Almost every morning I can see deer near the woods behind me and love watching them. Sometimes when I move around on my deck they seem to catch sight of me and are very alert as to my movements, even though there is a good distance between us. Although I have found that the does in particular can be very curious and if I am down wind will actually come closer to check me out. It is a joy to live in a country setting to be able to observe these beautiful animals.